Press Release : Plug and Mix releases Chainer! 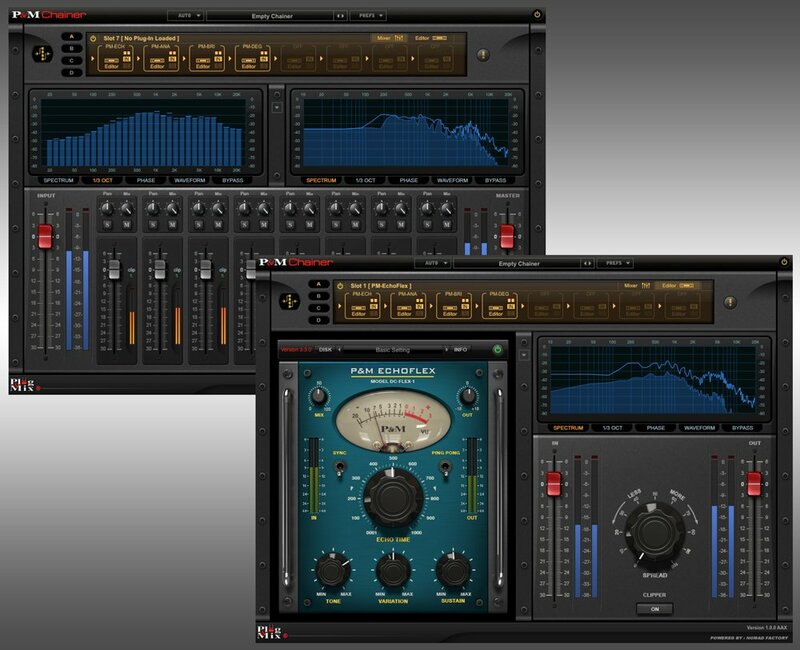 Plug and Mix Launches a VST / VSTi "Chainer" Utility! Plug and Mix today proudly announces the release of their awaited "Chainer" Application. P&M "Chainer" is an amazing utility that can load and chain P&M plug-ins but it can also...... load VST effects and VSTi instruments into any DAW including Pro Tools. Wow! BUT, If users purchase the FULL version, the Chainer will be able to load and "Chain" any VST effects or VSTi instruments from ANY manufacturer making it a powerful tool to use within any modern DAW including Pro Tools. For example, let's say you are a guitarist and want to save typical effect patches. The Chainer enables you to load up to 32 effects in series or parallel. So you may want to load and save a compressor, an EQ, an Amp sim, a delay, a reverb, a chorus, etc, and save the whole thing within a patch that can be loaded in other sessions or even other DAWs. The same concept can be applied to vocal patches, drum patches, or any other typical effect chains that you want to recall in future sessions. A time saver! The chainer natively contains demo versions of all 45 quality V.I.P. Series plug-ins. The Chainer is FREE for all REGISTERED P&M Plug-in owners. Therefore, the Chainer will automatically detect any authorised P&M plug-ins, ready to use. They can be chained in series or parallel to save/load presets that can be used in other sessions or even other DAWs.